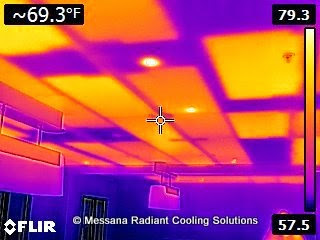 IR pictures taken during the start-up of Ray Magic radiant cooling and heating system in the new Headquarters of “The Fresh Connection” in Lafayette, CA. In the IR picture the Ray Magic panels are in heating mode. The surface temperature is about 80F (water supply temperature of about 90F) while the side wall are at about 60F. The building warmed up in about 30m-1h. Building ceiling surface: 4,700 sq.ft.